MeyerPlows.info - Meyer Plow A Valve Information. Used on the Meyer E-47, E-57, and E-60 units. Here are the three most common you may come across. I always get a "Mr. Micrometer" that informs me he ordered a 5/8" A Valve but it only measures 9/16". The reason is, when the square Coil A Valve came out, it had a "sleeve" near the top that measured 9/16", and the hole in the Coil measured 5/8". So from then on, all Coils had/have a 5/8" hole in them. It does NOT affect operation at all. 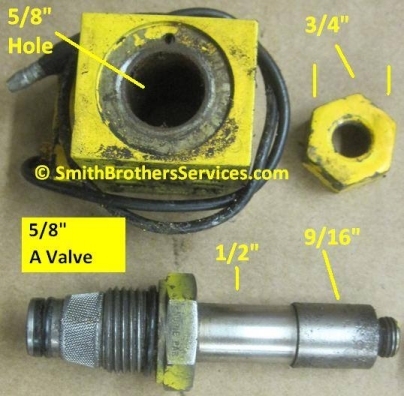 The 3/8" Deltrol A Valve was the standard from 1973 until the 90's. 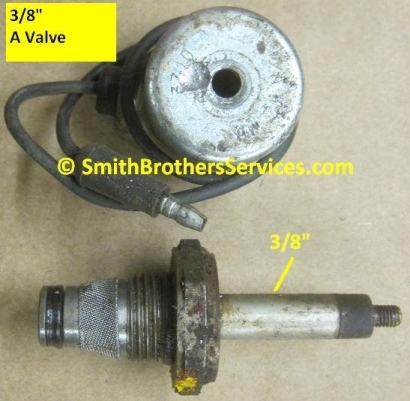 Note that the part the threads into the Sump Base is the same on all three of these Meyer plow pump A Valves, so as long as the Coil and Valve are replaced together, you can use any of these three, though the current 5/8" is the most reliable. This was the short lived 5/8" A Valve with the square plastic Coil. The Coil typically did not last long, and the design was scrapped. Here is the 5/8" one we sell, and it is identical in every way to the Genuine Meyer part. 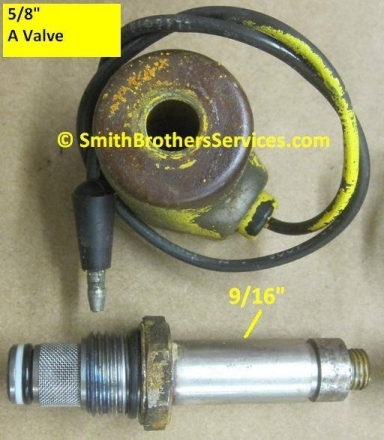 Here is the original 3/8" A Valve. Some people call them "Solenoids". When you try to find information on Solenoids, it is more difficult that if you were to look up the two individual parts; the Coil, and the Valve. Once assembled, they become a "Solenoid Valve". At least in my experience. When I order these from my vendors, not one of them calls the Coil a "Solenoid". When a customer asks me for a Solenoid, I hand them a Motor Solenoid, that goes under the hood and provides power to the plow pump motor from the vehicle battery. We call them Motor Solenoids, but they are often call a "Relay", "Starter Relay", "Starter Solenoid" or a "Contactor". I never understood why people call Coils Solenoids, when they are electo-magnetic Coils. When 12v is supplied to the coil of wire, it creates magnetism. This is why telephones use solid wires, because when you twist and coil wire, it creates magnetism when power is applied. This is also why the Coil does not need to fit snug on the Valve stem, just like an ordinary magnet, it just has to be close enough for the magnetic pull to do its job and pull the plunger inside the Valve, opening the spool so fluid can flow where it needs to. I sell A LOT of Coils, because the rumor is "Oh your plow won't (lift, lower, angle left, angle right) you need to replace the selenoids" and yes, they all misspell Solenoids. The fact is, 99% of the time the COILS are fine, it is the Valve that failed. Coils have no moving parts, so unless the wire breaks inside and they short out when power is applied, there is nothing to stop them from working. I still get pumps in for rebuild from the mid 1970's with the original Coils on them working fine. The A Coil DOES fail more than the others for one simple reason. When the plow is on the ground, and you are plowing with the plow in "Float" mode, you are sending power to the A Coil to hold the A Valve open, so the plow can follow the contour of the pavement. So it easily sees 10X more use than the B And C Coils that are use to raise and angle the plow right which only takes a few seconds. Also, when people do not follow directions, and hook the plow controls up to constant 12v power, and they have Toggle Switches or the Slik Stik controller, it is possible to leave the switch in the Float (down) position, thus killing the vehicle battery. What people fail to realize is that while the battery was being drained, the A Coil was being cooked for those "two days" or however long it took for them to try and use their plow vehicle again (and for the battery to drain). This is the older style 3/8" Coil for E-46 and E-47 Meyer plow pumps. The A Coil controls "Lower and Float". "A" Coil (5/8") for Meyer Plow Pumps - Fits E-46 (with updated 5/8" Valve), E-47, E-57, and E-60. The engraving (SMITH BROS) will be a running change. This means until the plain ones run out, we will not ship the engraved ones.